Presumed dead after a tragic accident, billionaire CEO Leonidas Betancur does not recall the vows he made four years ago. But after he is tracked down by his wife, Susannah, fragments of his memory reappear. He denied her a wedding night, and now he is ready to collect! And now the consequences of their passion will bind them together forever! 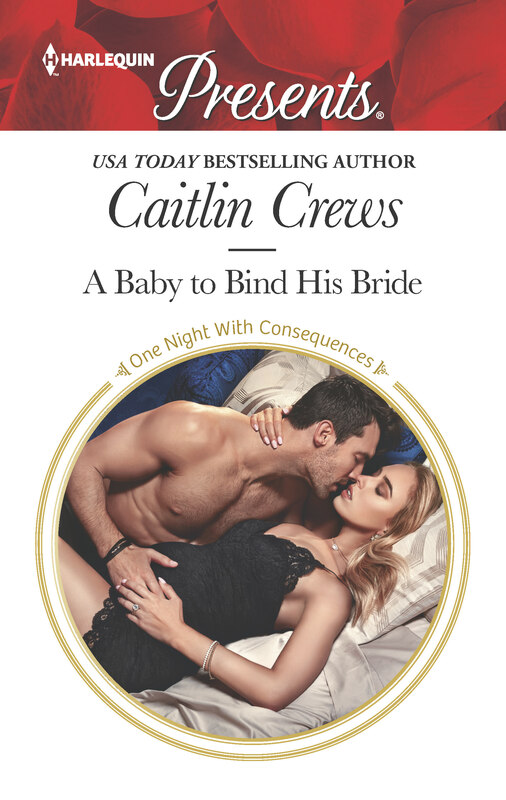 Follow Caitlin's A Baby to Bind His Bride board on Pinterest. “An actual god or a pretend god?” Susannah asked, as if that would make any difference. If the Count was the man she sought, it certainly wouldn’t. The hill they were trudging up was more properly a mountain, to Susannah’s way of thinking, but then, everything in the American Rockies appeared to be built on a grand scale. Her impression of the Wild, Wild West was that it was an endless sprawl of jaw-dropping mountains bedecked with evergreens and quaint place names, as if the towering splendor in every direction could be contained by calling the highest peak around something like Little Summit. “How droll,” Susannah muttered beneath her breath as she dug in and tried her best not to topple down the way she’d come. Or give in to what she thought was the high elevation, making her feel a little bit light-headed. That she was also breathless went without saying. Her friend in flannel had driven as far as he could on what passed for a road out in the remote Idaho wilderness. It was more properly a rutted, muddy dirt track that had wound deeper and deeper into the thick woods even as the sharp incline clearly indicated that they were going higher and higher at the same time. Then he’d stopped, long after Susannah had resigned herself to that lurching and bouncing lasting forever, or at least until it jostled her into a thousand tiny little jet-lagged pieces. Her driver had then indicated they needed to walk the rest of the way to what he called the compound, and little as Susannah had wanted to do anything of the kind after flying all the way here from the far more settled and civilized hills of her home on the other side of the world in Rome, she’d followed along. Because Susannah might not be a particularly avid hiker. But she was the Widow Betancur, whether she liked it or not. She had no choice but to see this through. She concentrated on putting one booted foot in front of the other now, well aware that her clothes were not exactly suited to an adventure in the great outdoors. It hadn’t occurred to her that she’d actually be in the wilderness instead of merely adjacent to it. Unlike every person she’d seen since the Betancur private jet had landed on an airfield in the middle of nowhere, Susannah wore head-to-toe black to announce her state of permanent mourning at a glance. It was her custom. Today it was a sleek cashmere coat over a winter dress in merino wool and deceptively sturdy knee-high boots, because she’d expected the cold, just not the forced march to go along with it. “Less?” Susannah had echoed as if she failed to catch his meaning, lifting a brow in an approximation of the ruthless husband she’d lost. Susannah had politely demurred. She wore only black in public and had done so ever since the funeral, because she held the dubious distinction of being the very young widow of one of the richest men in the world. She found that relentless black broadcast the right message about her intention to remain in mourning indefinitely, no matter what designs her conspiring parents and in-laws, or anyone else, had on her at any given time. She intended to remain the Widow Betancur for a very long while. No new husbands to take the reins and take control, no matter how hard she was pushed from all sides to remarry. If it was up to her she’d wear black forever, because her widowhood kept her free. Unless, that was, Leonidas Cristiano Betancur hadn’t actually died four years ago in that plane crash, which was exactly what Susannah had hauled herself across the planet to find out. Leonidas had been headed out to a remote ranch in this same wilderness for a meeting with some potential investors into one of his pet projects when his small plane had gone down in these acres and acres of near-impenetrable national forest. No bodies had ever been found, but the authorities had been convinced that the explosion had burned so hot that all evidence had been incinerated. Susannah was less convinced. Or maybe it was more accurate to say that she’d been increasingly more convinced over time that what had happened to her husband—on their wedding night, no less—had not been any accident. That had led to years of deploying private investigators and poring over grainy photographs of dark, grim men who were never Leonidas. Years of playing Penelope games with her conniving parents and her equally scheming in-laws like she was something straight out of The Odyssey, pretending to be so distraught by Leonidas’s death that she couldn’t possibly bear so much as a conversation about whom she might marry next. When the truth was she was not distraught. She’d hardly known the older son of old family friends whom her parents had groomed her to marry so young. She’d harbored girlish fantasies, as anyone would have at that age, but Leonidas had dashed all of those when he’d patted her on the head at their wedding like she was a puppy and had then disappeared in the middle of their reception because business called. Before morning, word had come that Leonidas was lost. And Susannah had chosen to be a force indeed these past four years, during which time she’d grown from a sheltered, naive nineteen-year-old into a woman who was many things, but was always—always—someone to be reckoned with. She’d decided she was more than just a trophy wife, and she’d proved it. And it had led here, to the side of a mountain in an American state Susannah had heard of only in the vaguest terms, trekking up to some “off the grid” compound where a man meeting Leonidas’s description was rumored to be heading up a local cult. “It’s not exactly a doomsday cult,” her investigator had told her in the grand penthouse in Rome, where Susannah lived because it was the closest of her husband’s properties to the Betancur Corporation’s European headquarters, where she liked to make her presence known. It kept things running more smoothly, she’d found. “Do such distinctions matter?” she’d asked, trying so hard to sound distant and unaffected with those photographs in her hands. Shots of a man in flowing white, hair longer than Leonidas had ever worn it, and still, that same ruthlessness in his dark gaze. That same lean, athletic frame, rangy and dangerous, with new scars that would make sense on someone who’d been in a plane crash. Leonidas Betancur in the flesh. She would have sworn on it. And her reaction to that swept over her from the inside, one earthquake after another, while she tried to smile blandly at her investigator. “The distinction only matters in the sense that if you actually go there, signora, it is unlikely that you’ll be held or killed,” the man told her. “Something to look forward to, then,” Susannah had replied, with another cool smile as punctuation. While inside, everything had continued that low, shattering roll, because her husband was alive. Alive. She couldn’t help thinking that if Leonidas really had repaired to the wilderness and assembled a following, he’d been trained for the vagaries of cult leadership in the best possible classroom: the shark-infested waters of the Betancur Corporation, the sprawling family business that had made him and all his relatives so filthy rich they thought they could do things like bring down the planes of disobedient, uncontrollable heirs when it suited them. Susannah had learned a lot in her four years of treading that same water. Mainly, that when the assorted Betancurs wanted something—like, say, Leonidas out of the way of a deal that would make the company a lot of money but which Leonidas had thought was shady—they usually found a way to get it. Being the Widow Betancur kept her free from all that conniving. Above it. But there was one thing better than being Leonidas Betancur’s widow, Susannah had thought, and it was bringing him back from the dead. He could run his damned business himself. And Susannah could get back the life she hadn’t known she wanted when she was nineteen. She could be happily divorced, footloose and fancy free by her twenty-fourth birthday, free of all Betancurs and much better at standing up for herself against her own parents. Flying across the planet and into the Idaho wilderness was a small price to pay for her own freedom. As if they were a dime a dozen in these parts. Perhaps they were. And then it didn’t matter anyway, because they’d reached the compound. One moment there was nothing but forest and then the next, great gates reared up on the other side of a small clearing, swaddled in unfriendly barbed wire, festooned with gruff signs warning intruders to Keep Out while listing the grisly consequences of trespassing, and mounted with aggressively swiveling video cameras. “This is as far as I go,” her guide said then, keeping to the last of the trees. That was the part that had given her security detail fits. But everyone had agreed. There was no way that Susannah could descend upon some faraway compound with an entire complement of Betancur security guards in tow when it was likely her husband was hiding from the world. She couldn’t turn up with her own small army, in other words. Even a few hardy locals would be too much, her guide had told her, because the sort of people who holed up in nearly inaccessible compounds in the Rocky Mountains were usually also the sort who didn’t much care for visitors. Particularly not if said visitors were armed. But a young woman who called herself a widow and was dressed to look as out of place on this mountain as Susannah felt was something else entirely. Something wholly nonthreatening, she hoped. Susannah didn’t let herself think too much about what she was doing. She’d read too many thrillers while locked away in the Swiss boarding school where her parents had insisted she remain throughout her adolescence, and every last one of them was running through her head on a loop this afternoon. Not helpful, she snapped at herself. She didn’t want to think about the risks. All she wanted—all she’d ever wanted—was to find out what had happened to Leonidas. Because the sad truth was, she might be the only one who cared. And she told herself that the only reason why she cared was because finding him would set her free. Susannah strode toward the gates, her skin crawling with every step she took. She knew the video cameras were trained on her, but she was worried about something worse than surveillance. Like snipers. She rather doubted anyone built a great fortress in the woods like the one she saw before her, sprawling this way and that, if they didn’t intend to defend it. She couldn’t see where the voice came from, exactly. But Susannah stopped anyway. And raised her hands up, though not entirely over her head. There was no point coming over completely submissive. “I’m here to see the Count,” she called into the silent, chilly forest all around her. For a moment Susannah thought nothing would. But then, slowly, a door at the side of one of the great gates before her swung open. She held her breath. Would this be Leonidas after all this time? A man came out through the door, but it wasn’t Leonidas. This man was much shorter than the husband she’d lost, with an alarming semiautomatic rifle slung over his shoulder and a distinctly unfriendly expression on his round face. “You need to get off our mountain,” he told her, waving the rifle as punctuation. But he was frowning at her as he spoke. At her clothes, Susannah realized after a moment. Because she certainly wasn’t dressed for an assault on a compound. Or even a walk in the woods, for that matter. “The Count sees who he wants to see, and never on demand.” The man’s voice throbbed with fervor. And more than that, fury. As if he couldn’t believe Susannah’s temerity in suggesting she should have access to a being of such greatness. It was possible she was imagining that part. What did she know about cult members? That would be a direct threat where she came from, Susannah reflected, while her heart beat out a desperate tattoo in her chest. She reminded herself that here, in the middle of this vast and dangerous wilderness, the people who held these places had a different relationship to their weapons. And to threats, for that matter. The man before her was perhaps being nothing but matter-of-fact. The man blinked at her as if he didn’t know what to do. Susannah didn’t entirely blame him. She didn’t cower. She didn’t shift her weight from side to side or give any indication that she was anything but perfectly calm. She simply stood there as if it was completely natural that she should be thousands of feet high on the side of a mountain in the Idaho wilderness. She gazed back at the strange man before her as if she marched up to the doors of cults and demanded entry every day of the week. She stared at him until it became clear that he was the one who was ill at ease, not her. “Who the hell are you?” he finally demanded.